Whenever you conduct a remodeling project, it is very important to improve the beauty of the living space and to enhance how you and your family use and enjoy your home. Because the bathroom is such a highly functional area, you can make a dramatic impact to your home via a remodeling project. As a local Anchorage bathroom remodeling contractor, I would be honored to assist you with the effort. Since 1996, Vogel Home Improvement has been dedicated to providing homeowners with the highest quality and most customized remodeling services possible in the Anchorage area. For the last two decades, I have been humbled by the fact that so many local residents have trusted Vogel Home Improvement with their properties. When you hire Vogel Home Improvement for bathroom remodeling in Anchorage, I will honor your trust by treating it as though I were performing the services for my own family. In this way, I can guarantee the best possible and most rewarding results. 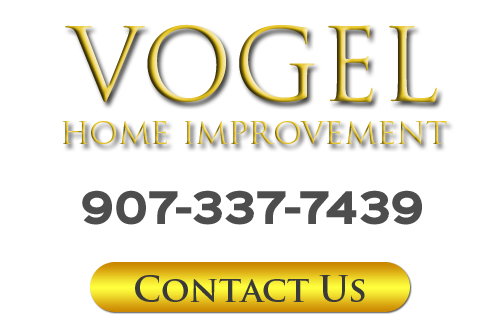 Call Vogel Home Improvement today if you are planning a bathroom remodeling project in Anchorage. I am here to help you in any way that I can with your project. As your remodeling contractor, I would be happy to answer any of your questions and to assist you in getting your project off the ground. Let's schedule your consultation today! Far too often, small interior bathrooms are not used to the utmost because they feel cramped. As your remodeling contractor in Anchorage, I can completely overhaul the design of your small bathroom. I can give it a more expansive feel with a combination of changes to the vanity, lighting, painting, and plumbing fixtures. You and your family will be stunned by the results. By far, the most rewarding bathroom remodeling projects take place in the master bath. You and your loved ones rely on this area each and every morning to get ready for the day. 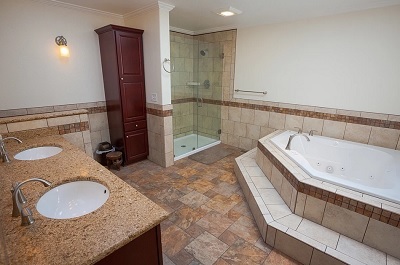 The master bath is also a place where you can relax in comfort. As your preferred Anchorage bathroom remodeling contractor, I can install new countertops, flooring, and vanity features that will beautify the living space. I can help you select and install spa-like fixtures, too, that will turn your master bath into a comfortable oasis that you will enjoy using on a daily basis. If you would like an estimate for bathroom remodeling in Anchorage, AK or nearby, please call 907-337-7439 or complete my online request form.